At the time of this newsletter, due to a family situation, the February CoTM shades are unnamed. 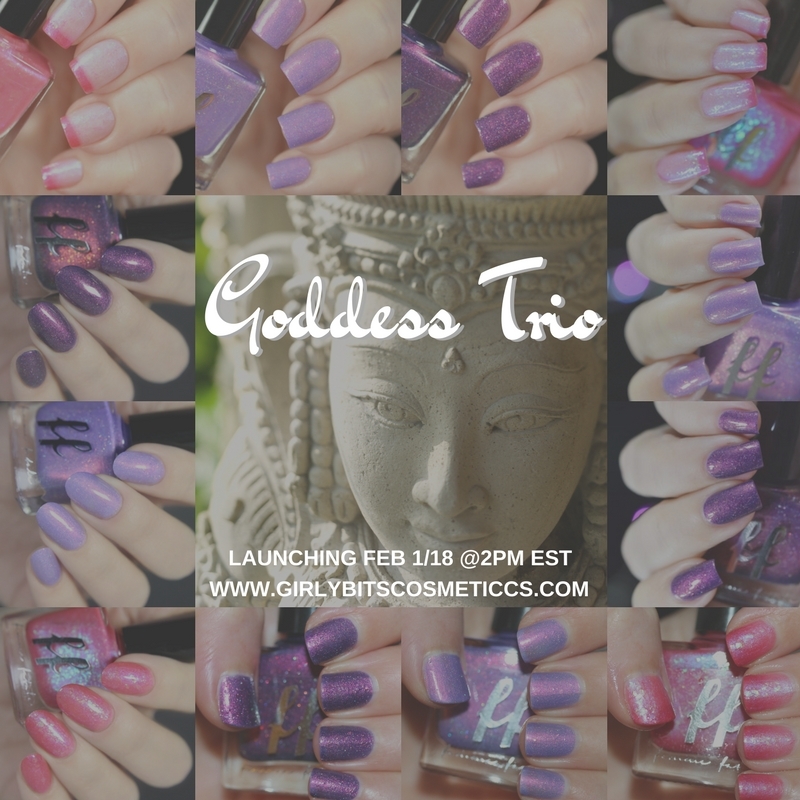 The names will be chosen shortly from the list of submissions in the Girly Bits Polish Lovers Facebook Group. Regardless of the names, you are going to want to pick up these beauties!! Thank you to everyone for your suggestions (and your kind words)! 1. January CoTM shades, Blues Years Resolution and Act Your Sage, will be available until Thursday, February 1st at 11:59pm EST so you can grab them along with the February shades! 2. 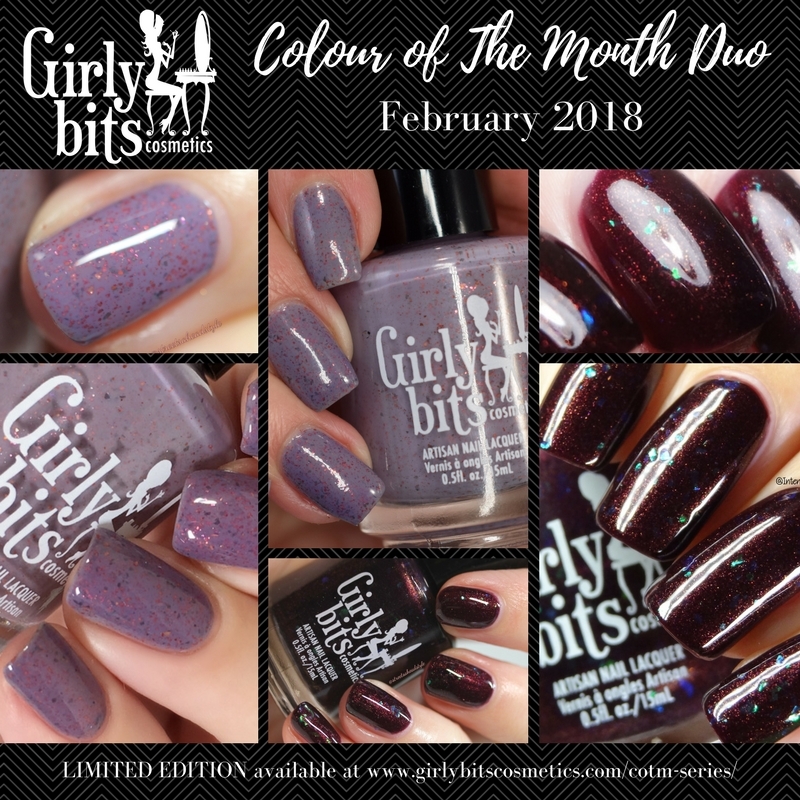 The February Girly Bits Polish Lovers Facebook group order will be open starting February 1st. 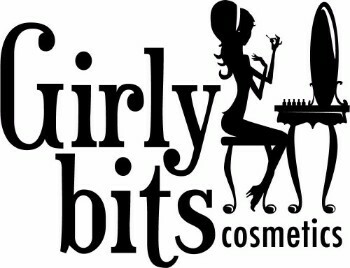 Girly Bits ships worldwide and offers FREE shipping for orders that total $80CAD or more shipped within Canada or to the US (approx $60 USD), as well as shipping discounts on overseas orders. The Femme Fatale package has arrived...just in time for our 2 o'clock launch today!!! I'm back today with another comparison post. 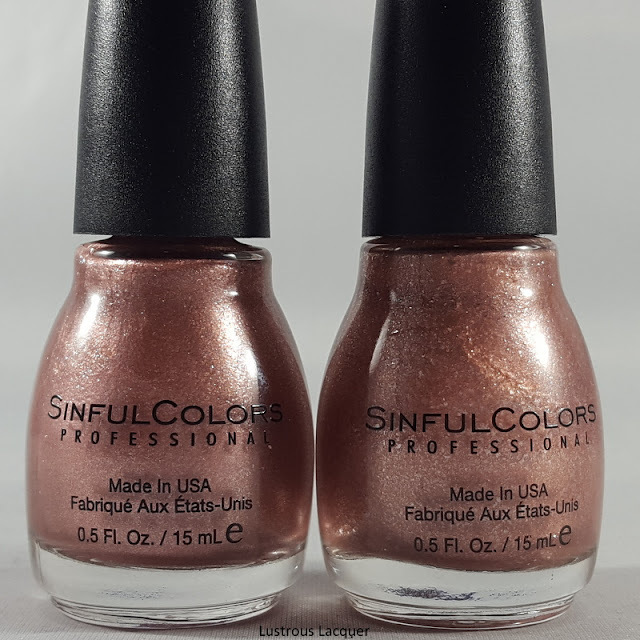 This time I'll be comparing two polishes from the same company, Sinful Colors. 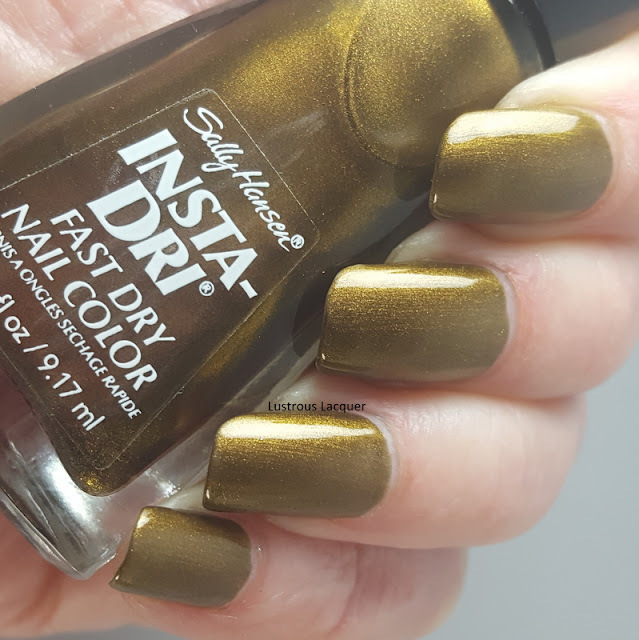 It's not often that a company dupes itself but Sinful Colors had been known to at least come close on more than one occasion. Take my post on Cream Soda vs Orange Cream for example. 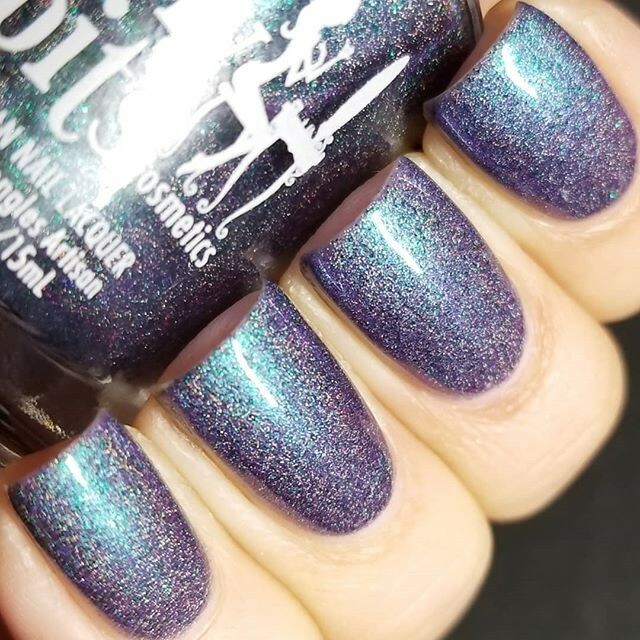 Add to that it seems like every time Sinful releases a new collection someone in the Sinfully Polished group asks for a comparison to a previous color. That's why when coming up with ideas for my dupes series I went straight to my Sinful Colors stash. Today I'll be comparing Hush Money, a core line color, to Gold n Roses from the 2016 Valentine's Collection. 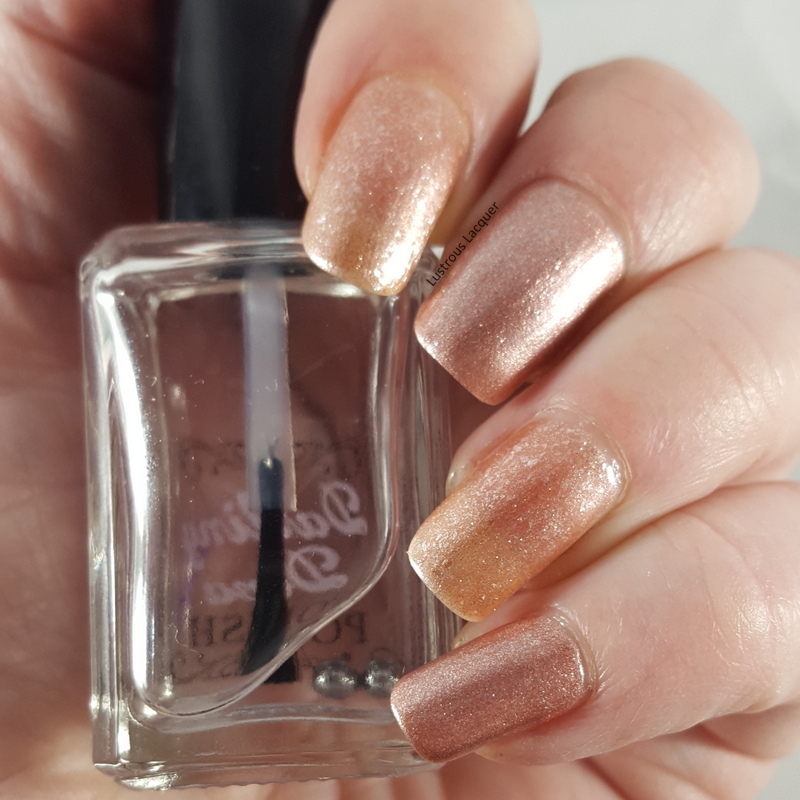 In the bottle, you can see that both colors have a nice rose gold tone. At first glance, these would appear to be the same color. It's not until you look closer that you can see there is a finish difference but the shades look exactly the same to me. Is it the same once the polish is on the nail? Both colors will be shown as two coats plus top coat. Not exactly the dupes I thought I had when looking at the bottles. 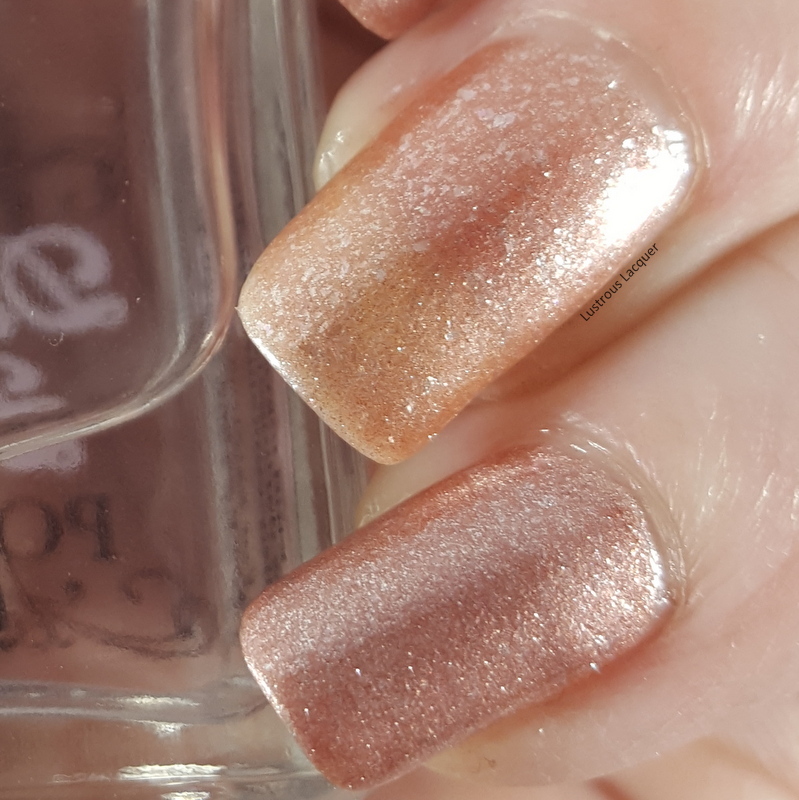 Gold N Roses (on my ring and pointer finger) is so much lighter and looks almost peach to me after 2 coats while Hush Money maintains that nice rose gold tone and full opacity. 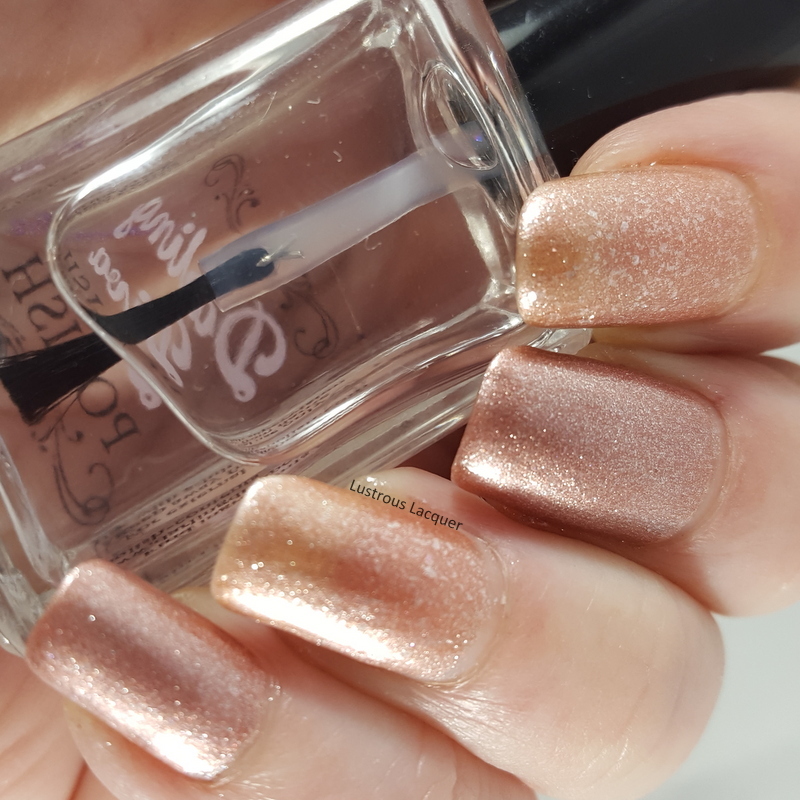 The difference in finishes is more evident on the nail than in the bottle. Hush Money is a micro-shimmer and Gold n Ross is a glass fleck. 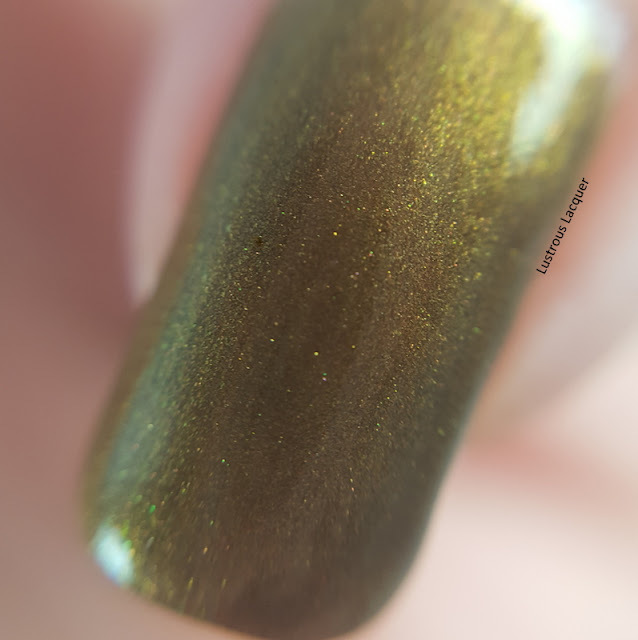 Gold N Roses is a much thinner polish with an obvious VNL after 2 coats. Hush Money is very opaque but not a one coater. I still had a slight VNL after one coat but it builds up quite nicely. Part of me wonders if I'd added a third coat of Gold N Roses if the colors would be closer to dupes. I just can't get over how different they look on the nail. It turns out that these two are not dupes at all. Do you need both in your collection? I'd say that's up to you. Personally, I prefer Hush Money, it's more opaque and has a richer rose gold tone. I'm not giving up on Gold n Roses yet though. I'm going to have to wear it with a third coat to see if I can build up to slightly darker color or at the very least get rid of the VNL. Which color do you prefer? Thanks for stopping by and Happy Polishing! Today I have a bit of a different post to share with you today. My daughter has decided that it's time to take over my blog again. It's been a few years since she's done this, in fact, the last time way back in January 2014 with her Laffy Taffy polish post. 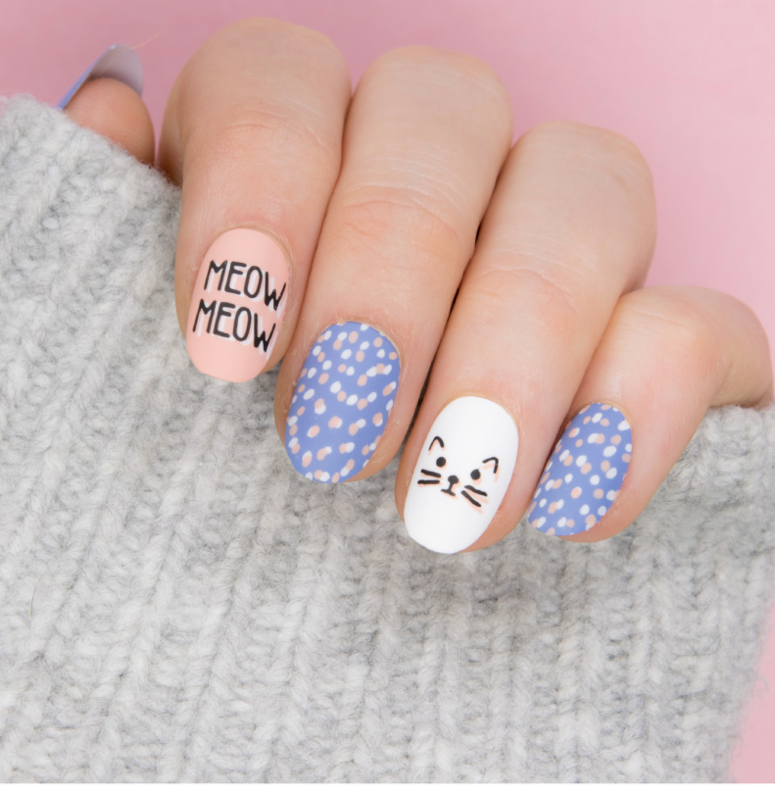 This time she tried her hand at a little nail art. 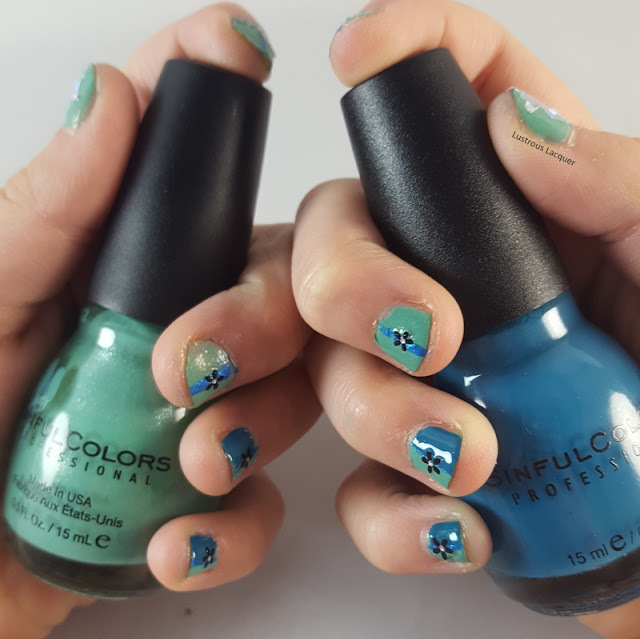 Sydney often comes into my office and asks if she can do watermarble designs. Typically she just makes the design in the water, removes it from the cup and starts another design. She's even starting her own collection of Sinful Colors polishes just so she can do this. Last month Sydney was hanging out in my office working on a watermarble design while I was putting together my red nail polish stamping comparison post and was inspired by my half black half white nails. Instantly the watermarble fun was forgotten and she wanted to do her nails in a similar way. This is what she came up with. At 9 years old, Sydney is already a very independent little girl. I haven't been able to pick out her clothes since she was 5. (Thankfully I'm still the one that buys them so I have some say over what she wears.) She actually painted her nails all by herself and did her own cleanup. While we need to work a little bit more on her clean up and hand pose I'm pretty proud of what she came up with. Both polishes used in this manicure are from Sinful Colors and are Ocean Side and Mint Apple. The blue stripe was done with a Striping polish I picked up from Sallys that had a little shimmer to it but otherwise was a pretty good match to Ocean Side. Of course, she had to use my Ribbit Stix unicorn decals the moment she saw them. Which I had just received in the Addie May Charity box. To finish her look off Sydney added a few flower stickers that I picked up ages ago but can't quite remember from where. I like the look that she ended up with and love that she wanted to photograph them and do a blog take over. She's come a long way with her painting skills since that first post and I hope it's not another 4 years before I can share her nails again. Thanks for stopping by and Happy Polishing! It's time once again for the Untired A-Z Challenge and the letter B. This time around I am once again only sharing 1 polish but I have decided that I may share 2 or 3 polishes for each letter just to help knock out a few more untrieds. 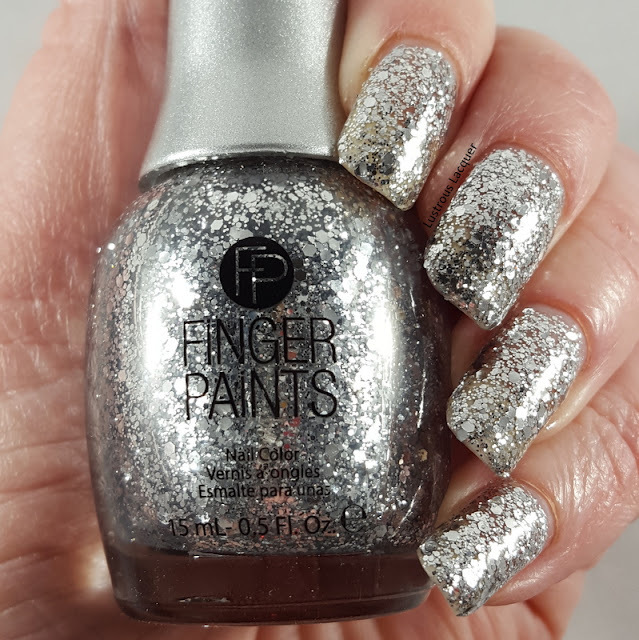 Like I mentioned in the event this is a totally laid back challenge and a fun way to work through those untried polishes a lot of us have in our collections. For my Letter B polish, I went with a polish I've had forever from Sally Hansen. Bronze Ablaze is part of the Insta-Dri line and sadly I believe is no longer available for purchase. That's the one bad thing about going back and using a bunch of untried polishes. I'll probably be sharing quite a few that are no longer available. I just hope you're like me and like looking at pretty polish no matter what the availability is. 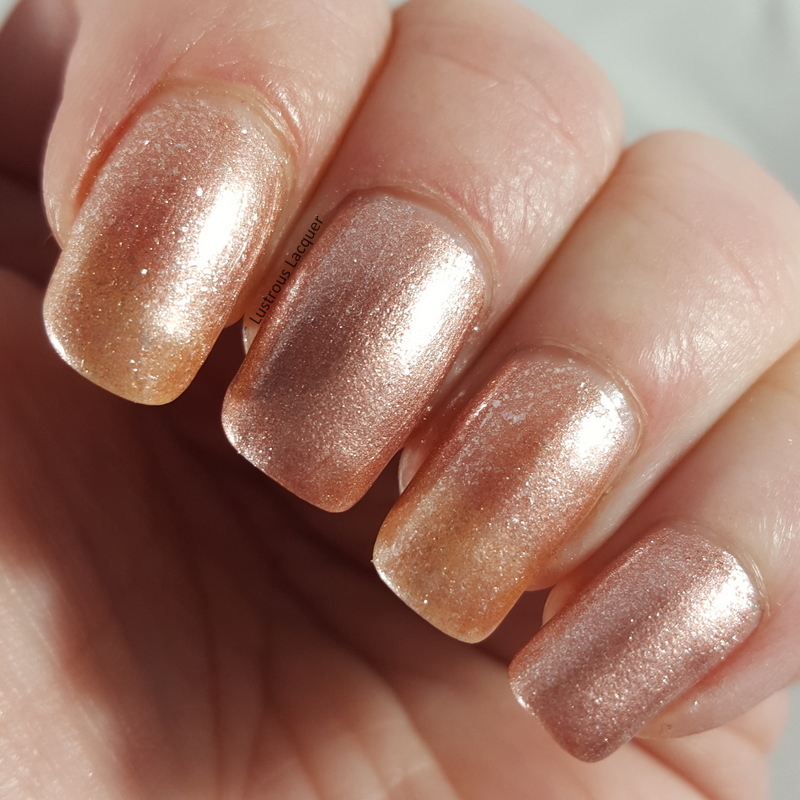 Bronze Ablaze is a metallic bronze polish with golden shimmer. 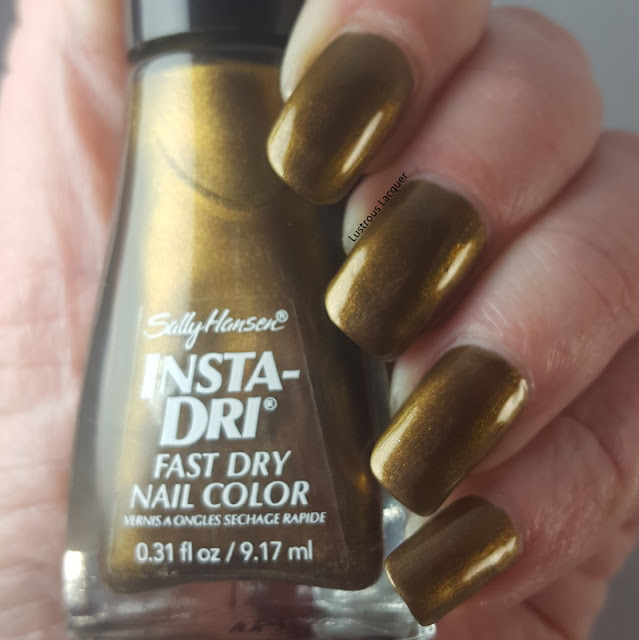 Like most of the polishes in the Insta-Dri line, this one is very opaque. I did have a slight issue with streaking when I tried applying this in thin coats. Everything evens out nicely with two coats and full opacity was achieved. Shown here is two coats plus a glossy top coat. Because of the metallic nature of this polish at certain angles, it can have a greenish undertone. 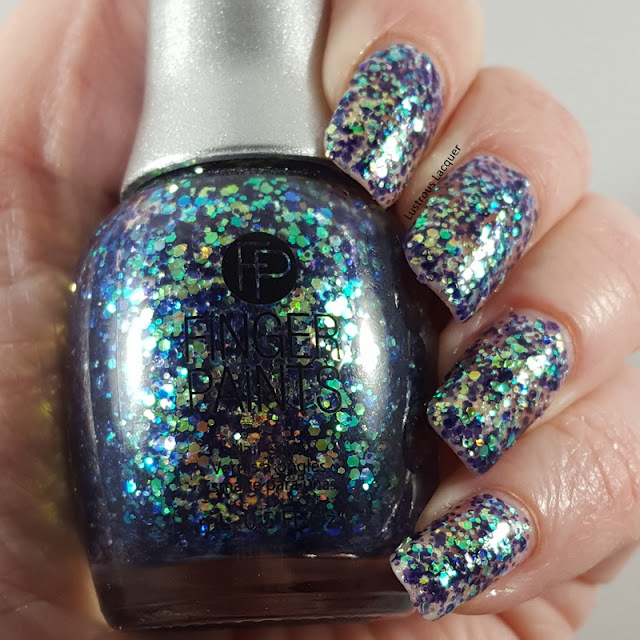 While there is a color shift this is not a duochrome polish. The color shift is simply a side effect of the metallic finish. Another side effect of a metallic finish is brushstrokes. Bronze Ablaze does have a few minimal brushstrokes that my camera was able to capture more than what I could see with my eyes. Once again I decided to add a little nail art. I know I won't be adding nail art to each color during this challenge though. I have noticed lately that some colors give me an instant idea of what to add to them while others seem to be better left on their own. 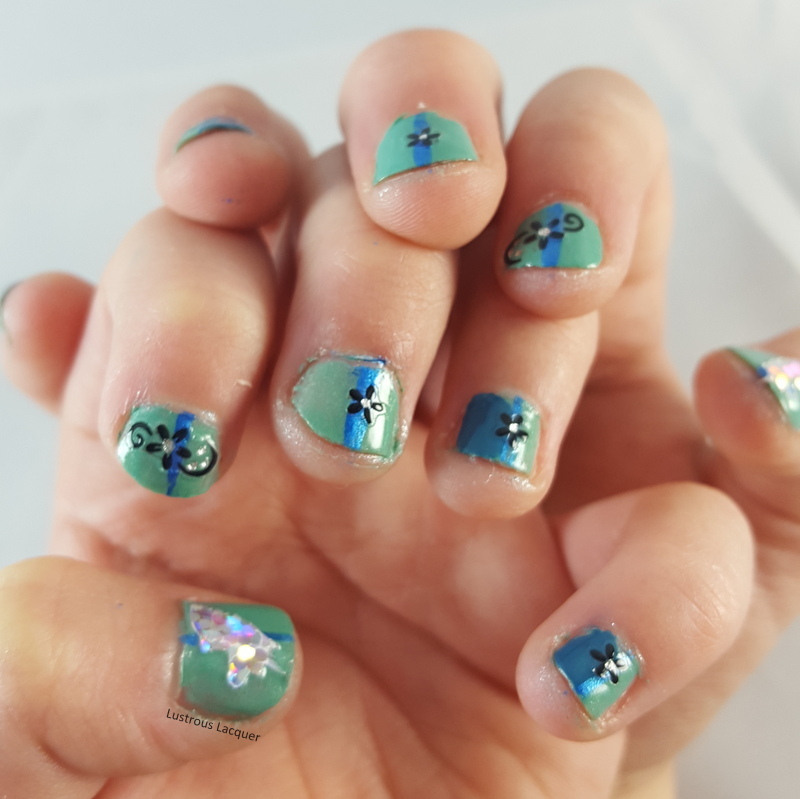 Anyone else ever have their nail art inspired by the color? For this loo, I stamped with Hit the Bottle Snowed in and two images from plate GPStamping #13 from My Online Shop. 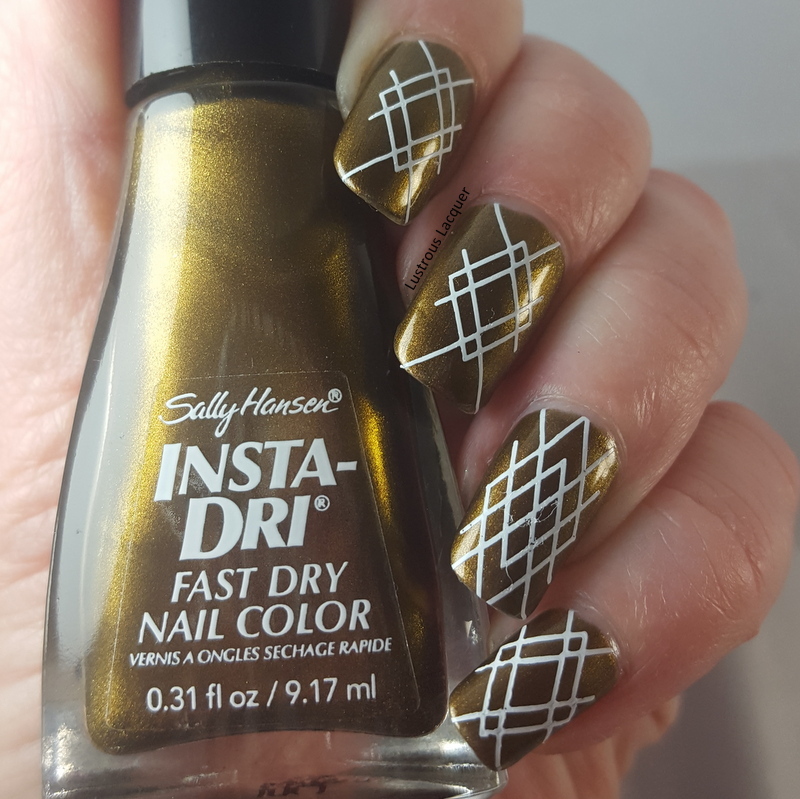 I have had a slight obsession with geometric manicures lately and finally did one myself. I have a feeling I'll be doing a few more this year also. I just like the crisp clean look they have. 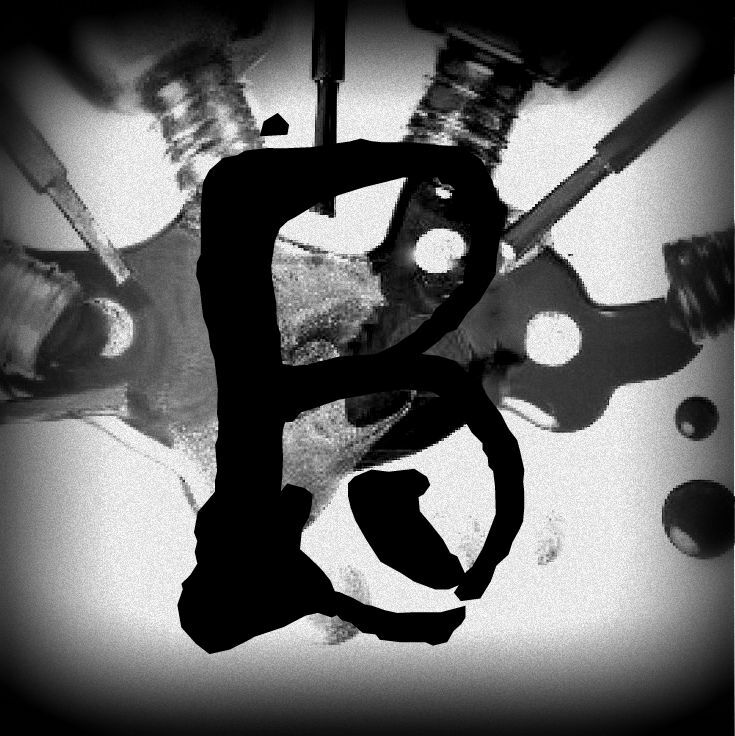 So that's my letter B polish. If you'd like to know more about the Untried A-Z challenge check out my Letter A post or the event on my Facebook page. Now let's see what other polishes people chose for the Letter B. Thanks for stopping by and Happy Polishing! 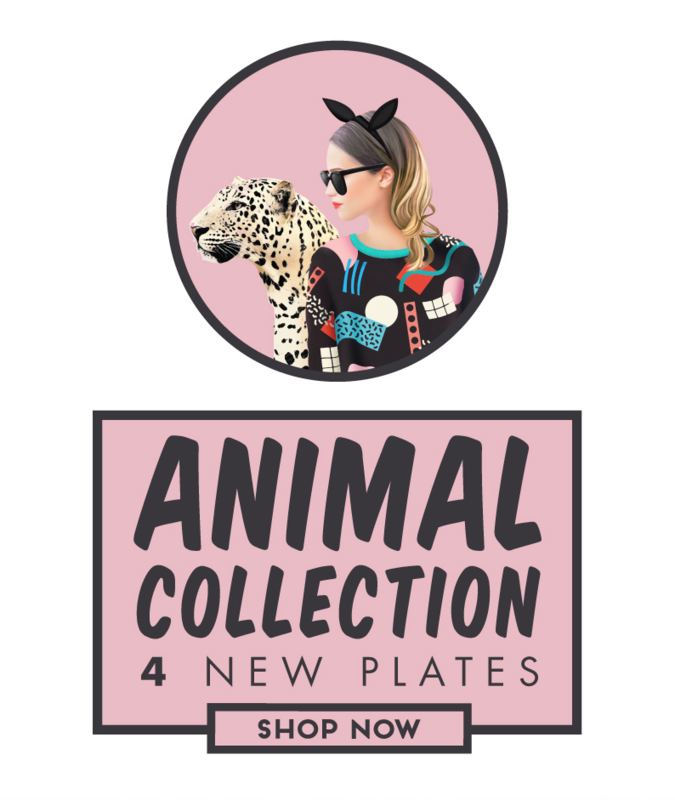 MoYou London is releasing 4 new plates in the Animal Collection. These new plates are filled with fun animal print and cute little saying. Let's take a look and see which ones make it to your wish list. 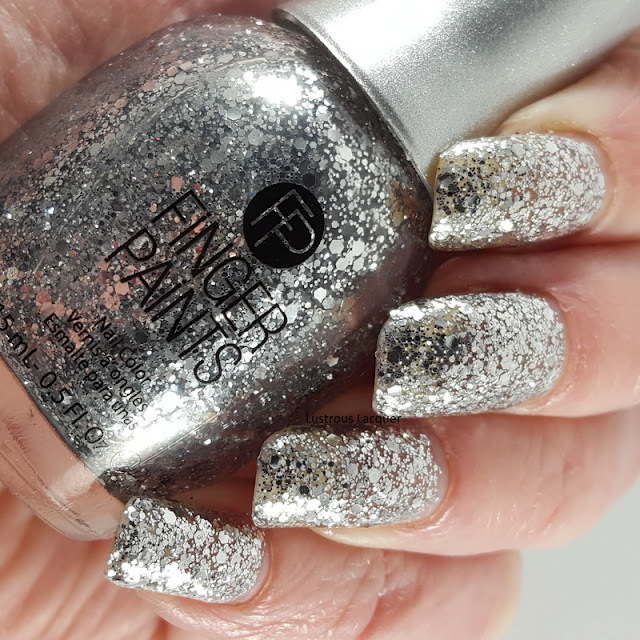 About a month ago I reviewed the Winter Glaze Collection from Finger Paints. At that time I was missing two polishes. Like I mentioned in my previous post I was able to find those missing polishes online and had put in an order. Now it didn't take a month for the polishes to arrive but it has taken me a month to finally get them up on the blog. The two polishes I was missing are Sterling Sculpture and Daubigny's Garden. 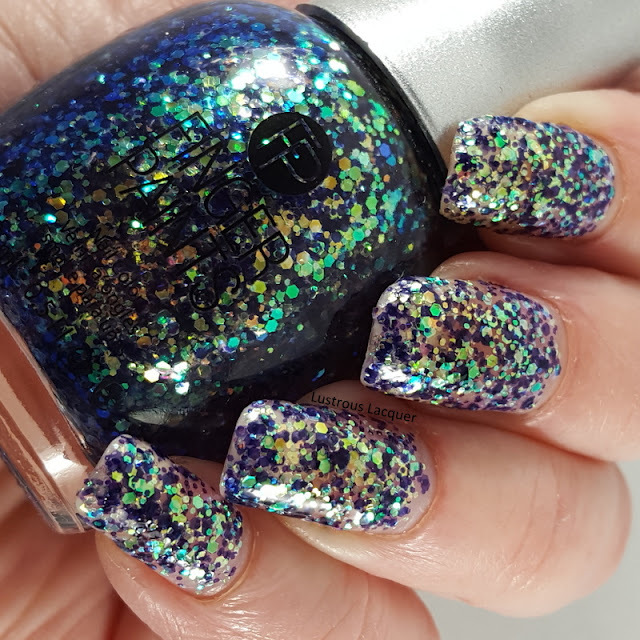 Both polishes are jam-packed with glitter and by looking at the bottles I can see why they were sold out at both stores I visited. We all know that appearances can be deceiving and I've had more than one bottle of polish let me down once I got them on my nails. But was that the case here? Let's find out. Color: Clear based polish with multi-sized silver glitters. Application: The first coat applied smoothly and with a medium amount of glitter. I was able to get 98% glitter coverage without using a sponge to apply the second coat. 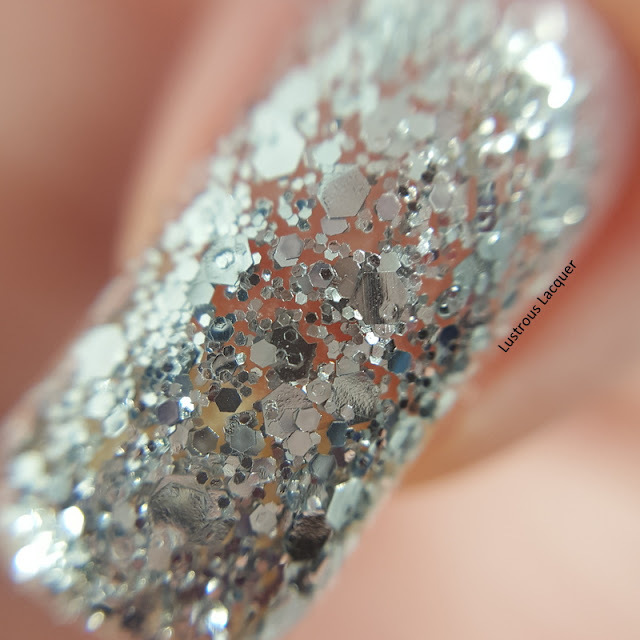 Each and every glitter lays completely flat on the nail but there is a slight texture when the polish dries. Shown as 2 coats plus top coat. 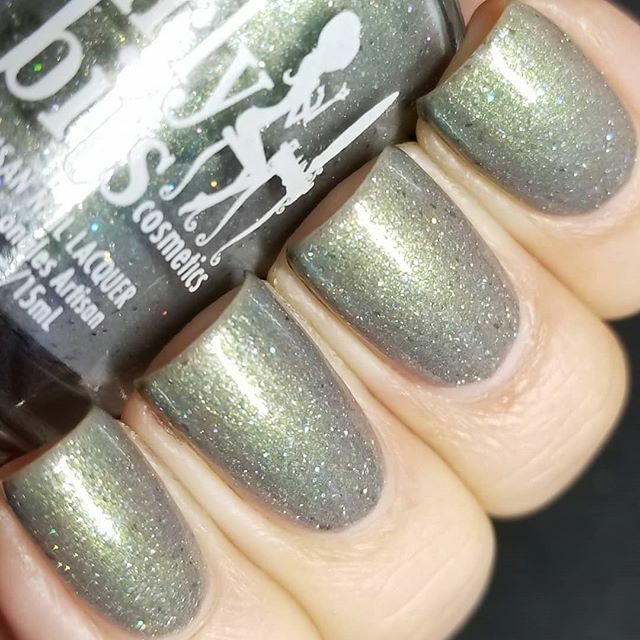 I actually like this polish and can see myself using it as a topper or for a glitter gradient. I can also see it looking good with some jelly polishes sponged over the top and some stamping. I do have to say that the glitter coverage looked much better to the naked eye then it does in these photos. I could barely see any nail through the glitter. Color: Clear based polish with multi-sized glitters that shift from gold to green to pink to blue to purple. Application: The first coat applied evenly but with slightly less glitter coverage that Sterling Sculpture. After two coats I was able to get decent glitter coverage but not quite complete coverage. I would recommend using a sponge to apply the second coat to get better coverage. The glitters do lay completely flat on the nail and there is a slight texture once dry. Shown here is two coats plus top coat. This polish for me was a bit of a letdown. I like it much better in the bottle than I do on my nails. Once again the glitter coverage looked better to the naked eye than what my camera shows. If I wear this one again it will only be as a topper rather than on its own. I do think it might look good in a glitter gradient. 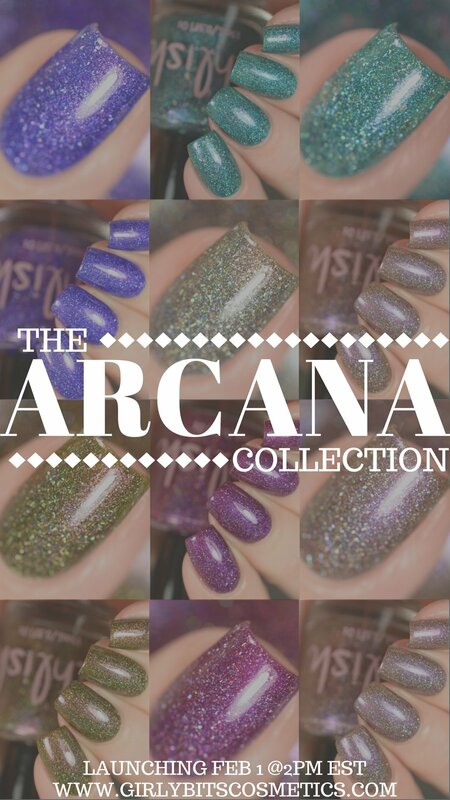 What do you think of the final two polishes from the Winter Glaze Collection? 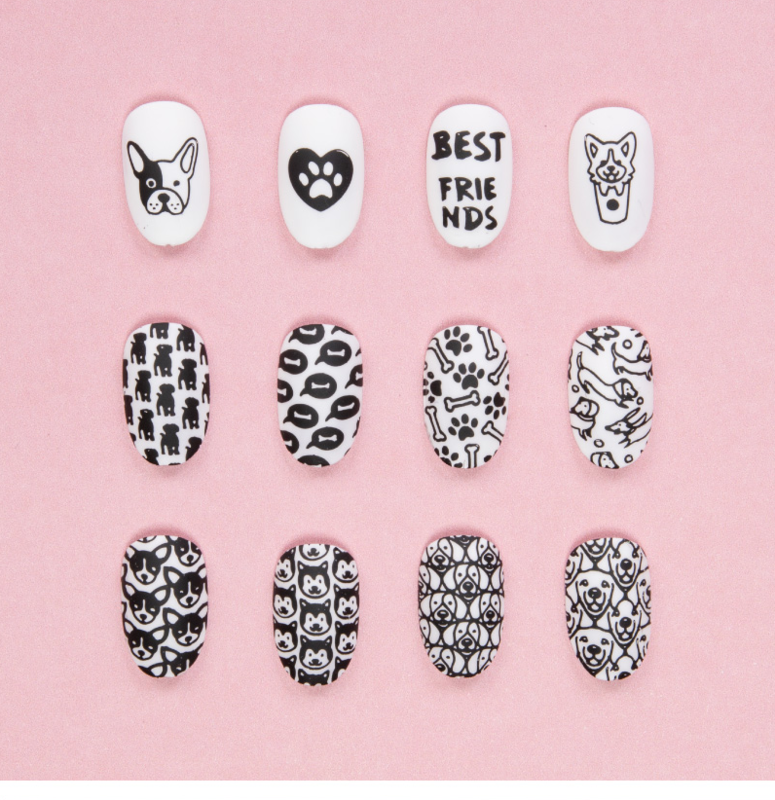 Should I have skipped them or do you think they will work for nail art? Thanks for stopping by and Happy Polishing!